We awoke early next morning and checked out of the hotel of doom and were a bit surprised to see the man who helped up last night still working at the front desk. Still, the location was pretty good and we rolled our luggage over to Shin-Osaka station and jumped on the 06:50 Sakura Shinkansen to Okayama. Though the train trip was pretty quick (~50mins) by the time we arrived in Okayama we were starving! Since we didn't want to waste too much time looking for somewhere to eat and there was a McDonald's in the station, we ended up having that for breakfast. The restaurant was pretty classy for a McDonald's; it even had LAN ports available at the seats and was almost completely filled with business people. I ate pancakes (hotcakes) and Kate got a McMuffin. The three main places we wanted to visit while we were in Okayama were Naoshima, Shimanami Kaido and the Kōraku gardens. Since we wanted to have a full day to ride along the Shimanami Kaido and the Kouraku gardens could be done on the day we left for Kōbe, we decided to make today our trip to Naoshima. Naoshima (直島) is a small island located in the Seto inland sea and is famous for its large number of contemporary art installations and museums. After filling up on McDonald's we walked down to our hotel which was located about 500m east from the station on a road parallel to the main road. When we left our luggage with reception we were relieved to find that the Koraku Hotel we were staying at was nice looking. We also noticed that there was a convenient looking conbini/pharmacy located at the bottom of the hotel. We were taking it pretty easy and looking in another convenience store outside when I checked my phone and noticed that the next train leaving for Naoshima left in 5 minutes! The train after that didn't leave until nearly an hour later! We raced back to the station and luckily already knew what platform we needed thanks to Hyperdia (sometimes it tells you, sometimes it doesn't). Unfortunately we were completely unfamiliar with the station and could not immediately find the platform. By the time we had only one minute to go I despaired and declared that we could not possibly make it. Kate said that we heaps of time and could still make it and spurred us on. We found the platform and made the train just in the nick of time. I'm usually the one to think that we have plenty of time left and Kate said that our many close calls during our trip had made her realise how long one minute actually was. Naoshima I've included photos of the ferry trip instead. The best way to get to Naoshima from Okayama is to catch one or two trains to Uno (some require a change at Chayamachi) and then get a ferry from Uno to Miyanoura port on Naoshima. The train we got from Okayama was the 08:24 Marine Liner 11 which, despite its name, is not a true "Liner" class train and is fully valid with the JR Pass. For those that are unaware; the JR Pass is not valid on "Liner" class trains which are special services that mainly target commuters travelling to/from the suburbs. The Marine Liner is actually just a rapid class train (快速 = cheerful + Fast = kaisoku), with a misleading name. The Marine Liner connects Okayama on the main island of Honshu to Takamatsu on the island of Shikoku via the Great Seto bridge. However, we were only going to go as far as Chayamachi where we would change to the Uno line. The Marine Liner was quite a nice train and although reserved seating was available, we just sat in the unreserved area as we were far too rushed to buy a ticket. Once we arrived at Chayamachi, about 15 minutes later, we found our Uno line train already there waiting for us. This train was similar to the one we caught to Shimokita station from Noheji in that it was a one man train and there was only one track between the stations. It took 30 minutes to reach Uno from Chayamachi and while I'd like to say we passed the time by playing Uno, we actually just looked out the windows. The area was pretty rural and we travelled through a lot of rice fields. One thing we noticed was that in the empty rice fields there were a lot of small (knee height) tepee shaped structures made out of straw. Neither of us had any idea what the purpose of these structures were at the time although now I've had a bit of time to investigate I've found that it's done to dry the rice after threshing and winnowing (both threshing and winnowing are processes used to remove chaff from grain). Once we arrived at Uno we quickly made our way to the ferry which is located just 200m away to the SSW. This ferry transports cars as well as people- which were driving on when we arrived. There's also a passenger only ferry which leaves less frequently from a different location nearby (SSE from Uno Station). The main ferry station on Naoshima is at the town of Miyanoura and is where we got our ferry to. The passenger only ferry stops at Miyanoura and also makes infrequent trips to Honmura, which is a town located on the other side of Naoshima. The ferry times were only available in Japanese so I've included them here on the off chance that someone finds them useful (they’re from the Japan book I made and are valid as of October 2012). Since the ferry was leaving pretty soon we quickly purchased our tickets from the vending machines. I put 1000 yen note into mine and it locked up and beeped an error! Luckily the man who was selling tickets at the window (and busy when we arrived) asked me how much money I put in. He refunded me from the till and directed me to use the other vending machine (which Kate had just used). We quickly ran over to the ferry, which departed moments later. Apart from tickets for transportation, many other attractions in Japan have these ticket vending machines located at the entrance. They’re often only in Japanese although they're usually pretty simple to work out. There are three main things you need to know: How many tickets? adult/child? and change. X枚 means "X flat things" and in this case would mean "X tickets". So, １枚 would be 1 ticket, 2枚, two tickets and so on. If 枚 isn't used to specify number then 人 might be. In this context X人 means "X people", so 1人 is 1 person, 2人 two people, and so on. 人 crops up again in the compounds used to distinguish between adults and children. 大人 (Big + Person = otona) means "adult" and 小人 (Small + Person = kobito or shounin) means "child". Sometimes change is not automatically dispensed in which case you press the お釣り (Honourable Prefix + Fishing = Otsuri = Change) button. The ticket machine at Naoshima also had the additional options of 往復 (Journey + Return = oufuku = return) and 片道 (one-sided + road-way = katamichi = one way). The trip from Uno to Miyanoura (Naoshima) on the ferry took about 20 minutes. At first we were admiring the views of the Seto Inland Sea from the outside top deck but we retreated down below to an indoor level as it was a little windy. I can't remember if there was any food sold here (I don't think so) but there were two vending machines where I bought a drink. Once we arrived at Naoshima we found a bus already waiting for us so we jumped on straight away- not even stopping to get a map from the information centre. Our plan was to start at the furthest away attraction and work our way back to the ferry terminal. Naoshima is a pretty small island with the different towns located only about 2 km from each other so it is possible to walk between them. However, as the terrain is quite hilly walking everywhere would be pretty strenuous and it's also a slow way to get around. If you're really keen about exercise it's possible to hire a bicycle which cost 500円/day. Since we were going on a big bike ride tomorrow we conserved our energy with the bus. The bus wound its way though some narrow streets across to Honmura on the eastern side of the island where we gained and lost a few people. We stayed on the bus all the way to last stop (tsutsuji-so) at the southern end of the island. After paying the 100 円 it cost to ride the bus we got off and hopped on to a free shuttle bus that was there waiting for us. We caught this bus all the way to its final stop, the Chichū Art Museum. Our plan was to walk back to Tsutsuji-so stopping at the museums along the way. The bus was full when it departed Tsutsuji-so and everyone apart from an American couple (who got off at the Bennese House), caught it all the way along with us. The Chichu Art Museum (地中美術館= Ground + Inside + Beautiful + Art + Building = Chichuu Bijutsukan) opened in 2004 and features artwork from Walter De Maria, Clauge Money and James Turrell. As you might suspect from the name, the museum is built mostly underground and was designed by architect Tadao Ando. Despite its subterranean position the building effectively utilises natural light in order to light its exhibits and interior. The bus did not actually take us all the way to the actual museum but dropped us off at another (above ground) building where we purchased tickets. This museums entrance fee was the most expensive of the lot at 2000 円 each. While we were buying the tickets we were asked if we spoke English, when we answered in the affirmative we were taken aside from everyone else. They all got an extensive talk in another room (about the history and artists I presume) while we just got the basic instructions (follow path up hill, be quiet etc.). It was a bit disappointing as I probably would have got something out of the talk. One positive however, was that we were the first of the group to head towards the museum and so managed to beat the rush. To get to the entrance we walked up a road that had a garden along the side. So as to maintain our lead, we decided to have a look at the garden on the way back. After showing our tickets to the lady at the gate we entered the museum. The first two rooms we encountered were completely open to the sky with one featuring a heap of plants and the other a heap of rocks. I think these were created by the building's architect (Tadao Ando) as they're not credited to any of the three other artists featured. The museum was set out in a fairly linear fashion although we did double back on ourselves a few times and got a little lost towards the end. While we were walking around I understood why we were told to keep quiet as although we were not talking some others were and causing quite a racket as the building echoed a fair bit. After having a look at the rock and plant rooms we went to experience the works of American artist James Turrell who uses light and space as a medium. We've actually encountered Turrell during out last trip to Japan at the 21st Century Museum of Contemporary Art in Kanazawa where we saw his "Open Sky" exhibit which is also featured at the Chichu Art Museum. This piece consists of a hole in the roof with very sharp edges which make the sky appear to be a painting. Since it depends on the state of the sky, we got to see different interpretations at the different locations; overcast/rainy weather in Kanazawa and mostly fine weather in Naoshima. Turrell's two other works were "Afrum, Pale Blue", which was a blue hexagon projection, and "Open Field ", which was our favourite exhibit in the museum. There's a limit on how many people can view "Open Field" and you have to take your shoes off before you can go look at it. I’m going to describe what it was like but if you're planning to go to Naoshima yourself one day, don't highlight the following sentences as they contains spoilers and may dampen your experience. Start After taking our shoes off we were directed around to a blank blue screen which had some steps leading up to it. We waited at the bottom of the steps until everyone was lined up and were then told we could go up the stairs and approach the screen. I was very surprised when the people who got to the top of the steps first walked straight up into the screen! After Turrell’s exhibitions we continued on to Walter De Maria's "Time/Timeless/No Time". This was a large room that had stairs all the way up it. Half way up the stairs there was a large dark sphere which you could touch. There were also some rectangular prisms covered in gold leaf. The final artist featured at the Chichū Art Museum is Claude Monet who, as the founder of French impressionist painting, needs no introduction. You know, the guy who painted all those water lilies. Special white marble frames surrounded four of his water lily paintings which were all located in one medium sized room. We saw his signature on three of them but could not find it on the forth. After Monet we left the museum and had a look at the garden on the way back down the road. This garden is a collection of plants that either appeared in Monet's artwork or were collected by him. There are about 150 types of plants and 40 different trees featured in a small area of about 400 square meters. Once we finished looking at the garden, we continued down the road to the Lee Ufan Museum. Along the way we encountered a Y-Junction with a secondary road leading off to the right of the main road, which curved left. The secondary road looked a little like a driveway as it had an open gate at its entrance. There was a man waiting here who, after asking if we wanted the Lee Ufan museum, directed us though the gate to the right. Lee Ufan is a Korean minimalist sculptor and painter who has spent the majority of his time in Japan. His museum is another building on Naoshima designed by architect Tadao Ando and was opened quite recently in 2010. Near the entrance there was a massive, skinny, square column that rose about 25 meters up into the sky. The entrance fee was much cheaper at 1000円 and we were lucky that there was no line. For some reason though Kate decided now would be a good time to get rid of all her small change! She spent nearly five minutes counting out coins so it was a good thing there was no one else behind us! The ticket guy laughed when she finally produced a fist of coins and made short work of adding them up. Kate ended up dumping about 30 one yen coins and a bunch of five and ten yen coins! Throughout the trip I'd been combo-ing 5 one yen coins with a five yen coin whenever I got one of the latter and dumping the 10 yen coins in vending machines. This way I had managed to keep on top of them all. I'm glad that Australia has long ago removed its one and two cent coins- the five cent coin feels worthless enough. The one yen coin is a bit interesting as it is made out of aluminium and the five yen coin has a hole in it- although so does the fifty yen coin. I don't think Japan will remove the one yen coin though due to the amount of use it gets as an offering at shrines and temples. Lee Ufan's paintings were very simple with many featuring single wide brush strokes. The brush stroke paintings looked like they were produced using different methods (such as rotation about an axis) with the stroke order indicated by the fading colours of each subsequent line. Other exhibits included rocks in various different positions. My favourite artwork was a rock that had a movie projected in the shape of what its shadow would be. The projection was simple (I remember rippling water) and the effect quite interesting. One of the rooms was meant for reflection and meditation and had a tatami mat floor that you could sit on after taking your shoes off. We sat here for a bit and, apart from the artwork; it was fun watching the other people in the room. There were two girls in the room with us who were together and while one of them was sitting very straight and staring intently at the art the other one looked like she was trying very hard (and mostly failing) to not fall asleep! Once we were finished with the Lee Ufan museum we continued along road to tho the final museum in this part of the island, the Benesse House. Along the way we went down a path and had a look at a group of rocks that were called the "Cultural Bath". The Benesse House is an art museum that doubles as a high end hotel and allows guests to view the artwork at all hours of the day. We actually went up the road to the hotel a little too far and missed the entrance at first; we soon worked out where we were going though and went in. At the entrance, there was a desk where we purchased our tickets (1000 yen each) and had the option of first walking either up or down to see the exhibits. Since we were feeling a little lazy we opted to start by going down. We actually passed a lot of people going in the other direction so I think we may have chosen the wrong way. Also, the numbers of the exhibits on our pamphlet counted backwards. Whoops. There were many different works of art in the Benesse house so I won't attempt to describe them all! My favourite was a massive wall of all the different flags of the world that had been made out of coloured sand in square containers. The containers were all joined by pipes and ants had been let loose within! In building their nest and tunnels the ants had rearranged the sand- with some countries flags suffering more than others! Australia was still mostly intact although there was at least one country that had been reduced to a swirling mess. I couldn't see any ants in there anymore but it was interesting looking at what they all did to the sand. Other exhibits I remember include a replica of a yellow boat on a beach that was visible from one of the balconies, as well as a big pile of driftwood. After we finished looking at the art we walked by the Museum's restaurant and, although it was a little expensive, we decided to have a bit of a fancy lunch there. Kate got squid ink Japanese Curry with salad as she had been wanting to try something with squid ink for quite a while. According to Kate it tasted just like normal Japanese curry (delicious) except, apart from the rice (at first), it was completely black! Her teeth and tongue even went black! I can't actually eat Japanese curry as it has onions in it, so I got the Museum Lunch Plate which was an entrée of pumpkin soup and bread with a main of local fish and some vegetables. The dish I ordered seemed popular; while we were waiting I saw many coming out and actually noticed that the portions were getting smaller! I think I got the last one as there were some Americans nearby who had ordered just after me and who were complaining the restaurant had run out. There were actually heaps of Americans all over Naoshima for some reason. Many more than most other locations in Japan. It seemed like many of them were staying at the Benesse house but I have no idea what caused so many of them to want to come to Naoshima. It was quite unexpected. Both the pumpkin soup and fish were extremely delicious and I thoroughly enjoyed my meal. I easily had big enough portions as I was quite full and very satisfied after finishing. The restaurant was on an upper floor of the museum and had a grassy outside bit that overlooked Naoshima. We spent a little time out here enjoying the views and taking some photos. After lunch we walked back to the Tsutsuji-so bus stop where we had changed buses in the morning in order to get the paid bus to Honmura. On the way back we passed by other sections of the Benesse house which housed hotel guests who opted not to stay in the actual museum building. Along the way we also passed by a beach and the famous Naoshima Pumpkin! It was on a platform that was almost flush with the water level and was very vibrantly coloured. After giving it a bit of tap I discovered that it was hollow. We took some photos of us in front of the pumpkin which turned out nice, although I do regret not asking Kate to pose like a pumpkin. There were actually two other people visiting while we were there although we managed to keep each other out of view in photos by standing on opposite sides of the pumpkin to each other. The bus came shortly after we arrived and we caught it to Honmura-ko in Honmura, which is a town located on the eastern side of Naoshima. Honmura is the site of the Art House Project which is a number of old abandoned houses, workshops as well a temple and a shrine which have had their interior converted into works of modern art with their exterior left to blend into the traditional Japanese architecture of the town. We had a little trouble finding the Honmura Lounge at first which is where we bought tickets to visit all the houses except Kinza (which was shut today). After buying the tickets (1000 yen) we were advised to go to Minamidera (南寺 = South + temple) first as only a certain amount of people are allowed in at once and there may be a wait. We followed this advice and headed straight to Minamidera. Once we arrived we found a small line and a short wait for the next group of people to be allowed in. Minamidera is a large rectangular building designed by Ando Tadao with the interior artwork created by James Turrell. It was our favourite of the art houses and, as with "Open Field", a description might spoil the experience so don't highlight the following sentences if you're planning on visiting it yourself. Start Just before it was our turn to go inside the guide explained (in Japanese) that it was really dark inside and that we had to use our hands to follow the wall to our seat. Once we arrived at our seat we were to remain quiet and look forwards until instructed otherwise by the guide inside the building. We were also given a card that had these instructions written in English. When it was our turn to go in we went through no doors (just corners) but, after a couple of turns, found it was indeed pitch black. I couldn't even see my hand in front of my face! Once we were sitting we looked towards the front and could not see anything at first. Gradually, a blank screen became visible. While we looking at the screen soft background water/bird sounds were playing. The screen was very dim and looked to be flickering a bit and changing colours, although I could not tell if that was real or just my eyes playing tricks on me. As we sat it became brighter which I think was due to our eyes adapting to the darkness. After about 10 minutes the screen was looking fairly bright and we were told that we were now allowed to walk around. The next house we went to was Haisha (はいしゃ) which was created by Otake Shinro, who also designed the famous Naoshima bathhouse (I Love Yu). It was the only one of the houses that looked different from outside with rusted corrugated iron walls that had a variety of different things attached. Inside it was possible to look around the two levels which had a half constructed feeling and contained a number of large sculptures. The biggest was a statue of liberty replica that went up through two floors. There was also a toilet which I hoped no one had ever tried to actually use. As the different houses were scattered throughout the town it felt like a bit of a scavenger hunt trying to find them all! We actually got a little lost looking for the next house we visited, Ishibashi. We realised the road we initially turned down was not the right one when it got far too narrow and twisty compared to the road we wanted. Ishibashi (石橋 = Rock + Bridge) was formally the home of a rich salt merchant and was built around 100 years ago. The building and gardens were restored for the Art House Project and feature two large paintings by Senju Hiroshi. Ishibashi was a nice old building to walk around with a pleasant garden. One of the rooms had a wooden ceiling with an interesting design. Next up was Gokaisho (碁会所 = Go (game) + Meeting + Place) which, as the name suggests, is a former location where people gathered to play the game "go". Go is that game you might remember that uses a heap of black and white stones. The artist featured at Gokiasho was Suda Yoshihiro who had hand carved some wooden camellia flowers. The crafted flowers were housed in a traditionally designed building which looked out over real camellia flowers in the garden outside. The penultimate house we visited was Kadoya (角屋 = Corner + Shop) which was probably my second favourite. It was originally build about 200 years ago as a residence and was the first art house to be restored and artistically outfitted. Inside, Tatsuo Miyajima has created a number of time related works, the most striking of which is a large dark pool with dozens of submerged LED digital clock screens which blink on an off at different times. There's also a scroll painting with digitally shaped numbers and a window that has a digital clock built into it. Kate thought we only had about 10 minutes until the bus came and as it was the last bus to connect with the next boat we wanted to make sure we didn't miss it. The next boat back to the mainland after that one departed over an hour later. For this reason, we ended up running around a bit frantically looking for the final art House, the Go'o Shrine (護王神社 = Safeguard + King + God + Shrine = Goou Jinja) . This Edo period shrine was restored by Hiroshi Sugimoto who also designed a new front structure and constructed an underground chamber. On the way there we starting running down one road that some people were coming back along only to have them tell us "Ikidomari" which means "dead end"- so we went back and managed to find it at the top of a hill. When we arrived we were pretty puffed but had no time to rest. We had a quick walk around the shrine and went to leave but were stopped by the man looking after the shrine who said there was still more to see and gave us a torch. We were then directed to a passage that lead underneath the shrine to an underground chamber which was pretty cool. We could see up through the glass steps that led up to the main shrine building and let the sun shine through to provide light to the underground chamber. We came out a short time later and gave the torches back to the man. He asked us if we liked it and I think I said something like "Sugoi" (Amazing). I think I would rank Go'o shrine as my third favourite Art House with the full ranking from best to least best (they were all good) as: Minamidera, Kadoya, Go'o Shrine, Haisha, Ishibashi and Gokaisho. We flew back down the hill and around to Honmura-ko to get the bus. I hadn't had a drink in a while and was dying of thirst by the time we arrived. After all that it turned out that Kate had got the current time wrong and we had heaps of time to spare! Well, there was about 10 minutes, but it felt like heaps of time due to amount of stuff we'd just crammed into the same interval. It was good to have a bit of a rest at any rate and I quenched by thirst with a delicious cold lemonade (7-up) from a nearby vending machine. Kate got a bottle of water from the same machine. When the bus arrived we realised that it also serviced another bus stop in Honmura (Nokyo-mae) which was located right next to the Honmura lounge where heaps of people got on. Since we were on early we were able to get a seat at least- many people who embarked at Noyko-mae missed out and had to stand. Once we arrived at Miyanoura we had about 10 minutes before the boat left and were faced with a decision between a quick look at the James Bond museum or the shop at the ferry terminal. We decided on the 007 museum which was located about a two minute dash away and was free to enter. This museum was constructed in order to bring attention to Raymond Benson's James Bond novel "The Man with the Red Tattoo", which is set partially in Naoshima, in the hopes it will be adapted into a film. While the museum is fairly small, consisting of just one room, it contained a fair amount of paraphernalia from Bond movies. There was also one of those face cut out boards of Bond punching a kappa that we amused ourselves with by taking a photo of Kate as the Kappa and me as 007. After having a look around we rushed back and onto the boat where we took some photos of another one of Naoshima's pumpkins before departing for the mainland. The ride back was fun and we took lots of photos of the islands dotted about the Seto Sea as we said goodbye to Naoshima. Since we were not allowed to take photos of the artwork most of the photos in this post were taken during our trip back to Uno. Naoshima’s economy is dominated by Mitsubishi Materials which operates a number of refineries on the north side of the island. On the way back we passed by some of this industrial activity. The afternoon sun shining on the Seto sea was very beautiful. Once we arrived at Uno we had a little bit of spare time before the train was due to depart which we used to get three bananas and some plain milk from a convenience store. It was nice chewing the banana and drinking the milk as it was a bit like a milkshake. The Uno line took us back to Chayamachi where transferred to the Seto-Ohashi line which took a little (~5mins) longer than the Marine Liner. The platform layout at Chayamachi was a bit unusual as the Uno Line trains have a platform (2 & 3) on either side so you can get off on the left or right side. I believe it is like this to allow for quick transfers. After arriving back at Okayama we went up to our hotel room and had a little bit of a rest before going back out to have a look at the shopping street down the road. Most of the shops were either shut or shutting when we arrived but we did have a look in a supermarket where Kate got some Jelly and a hot sweet potato for dinner. The sweet potato was huge and Kate said there was no way it’d be possible to finish it; you’d either get full or sick of sweet potato. I can’t remember what I had exactly but it was probably something similar. Kate also purchased some cereal for breakfast. 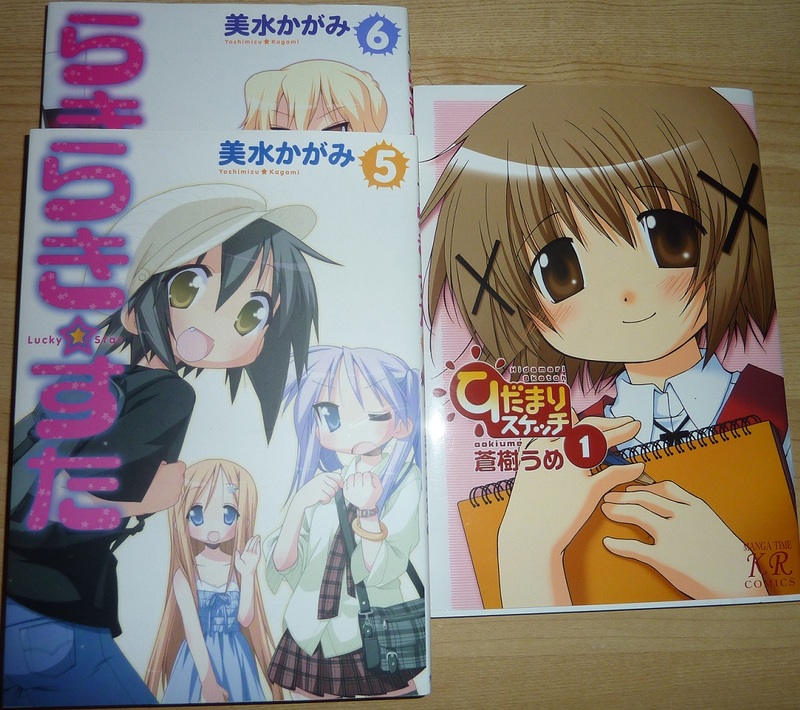 We had a look further down the street where there was a Melon Books and Animate combined into one shop. Melon Books was on the top floor and Animate on the bottom floor. 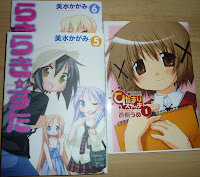 The shop was pretty small but had a reasonable selection and although I wanted to save my purchases until Tokyo I bought a few volumes of manga: Lucky Star 5 & 6 and Hidamari Sketch 1. When we got back to the hotel we spent some time planning tomorrow's bike ride along the Shimanami Laido. Kate was a bit worried about getting bitten by mosquitoes so we went down to the convenience store/pharmacy where to buy some bug spray. I didn’t know what it would be called in Japanese so it was a little tricky- I kept an eye out for 虫 (mushi), which is the kanji for bug. Happily I managed to find some and learnt that the full term for bug repellent is 虫よけ or 虫除け (Mushiyoke = Bug + Exclude). With that all sorted out we went back up to our room and tried to get an early night sleep before our big ride tomorrow! Thank you very much for the comment and I'm really glad my post is helpful! So If I'm not mistaken by your post, all the tickets to the main attractions on the island (Benesse House, Chichu. Art House Project, dsb) are available to be bought on the spot? So there is no need to make a reservation or anything beforehand ? I know how worrying about little details feels, but I've found so far that everything that doesn't appear clear online is actually quite obvious and straight forward once you're actually there. You're correct that we didn't have to reserve anything before hand when we went and were able to simply pay for entry at the entrance to each attraction- which were basically art museums. I'm not sure what the dsb you mentioned is though. Note that the art houses are scattered around and you can pay for a combo ticket for all except Kinza. The only thing you'd have to make a reservation for would be if you were staying at accommodation on the island, or if you wanted to see Kinza which is one of the art house projects but does require reservations here: https://bh.naoshima-is.co.jp/english/kinza/kinza.do . It was closed when we went though so we didn't go. Where did you stay in Okayama? Was it easy to commute? I am Japanese and from Tokyo but my friend is going to travel solo there, so trying to as helpful as possible. Any recommendations would be greatly appreciated!!! Thanks so much! We stayed at the Koraku Hotel (後楽ホテル) which wasn't too far from the main station and is on the way to Okayama castle so we found it to be a good spot. Hello Eric, i was wondering if i stay in Kobe for 2 dats. will i be able to visit naoshima for one day? Yep, Naoshima would work great as a day trip from Kobe! It'll take about two hours each way, including the boat, so it's a little far but not too bad. I'd try and leave early (around 8am) and then head back to Kobe in the late afternoon (4-5pm). I was wondering, how long did you spend on the island doing all the things that you did? Thank you for giving so many details and your blog post made me want to go to Naoshima immediately! I'm trying to plan a day trip from Kyoto, and am seeing if it's going to be a tight rush. As far as I can work out we were on the island from about 10:30 until 3pm. So I guess 4-5 hours is a good estimate of the time we took. I think you can do it as a day trip from Kyoto if you leave early. It will take 2-3 hours to get to Uno and then a 15-20min ferry. It will be a long day but definitely possible. Thank you for you helpful post. We are tossing up whether to do a day trip from Okayama, or stay a night on the island. Did a day trip seem rushed, or did you find it worked well? I don't think that a day trip from Okayama will feel rushed at all. We did basically everything and we not only came all the way from Osaka but we also stopped in at our hotel on the way. On the other hand if your budget allows it might be nice to stay on the island as they do have some unique accomodation, such as Benesse House which gives you 24 access to the museum. Don't decide to stay overnight due to concerns about time constrains though.